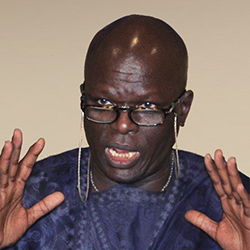 Born in Senegal in 1941, Doudou Diène holds a Law degree from the University of Caen, a Ph.D. in Public Law from the University of Paris, and a diploma in Political Science from the Institut d’Études Politiques in Paris. In 2017, he was appointed by former President François Hollande of France to help lead the public interest group, “Mission on the Memory of Slavery, Treaties and their Abolition.” And in 2018, he was appointed Chair of the Commission of Inquiry on Burundi by the President of the United Nations Human Rights Council. After serving as Deputy Representative of Senegal to UNESCO (1972–77) and, in that capacity, as Vice-President and Secretary of the African Group and Group of 77, he joined the UNESCO Secretariat in 1977 and was appointed Director of the Liaison Office with the United Nations Permanent Missions and departments in New York in 1980. Between 1985 and 1987, he held the posts of Deputy Assistant Director-General for External Relations, Spokesperson for the Director-General and Acting Director of the Bureau of Public Information. After a period as Project Manager of the “Integral Study of the Silk Roads: Roads of Dialogue,” aimed at revitalizing East-West dialogue, he was appointed Director of the Division of Intercultural Projects in 1993 (now called the Division of Intercultural Dialogue). In this capacity, he directed various projects on intercultural dialogue, including the Slave Route, Routes of Faith, Routes of al-Andalus, and Iron Roads in Africa. In 1998 he was placed in charge of activities pertaining to inter-religious dialogue, and in 2002, he was appointed by the Commission on Human Rights as Special Rapporteur on Contemporary Forms of Racism, Racial Discrimination, Xenophobia and Related Intolerance, a mandate that was later extended by the Human Rights Council. In 2011, he was appointed United Nations Independent Expert on the Situation of Human Rights in Côte D’Ivoire, and served as Member of the United Nations Independent Commission of Inquiry on Gaza from 2014-15. He is the author of numerous publications and has chaired and been the distinguished guest on various panels, radio, and television programs, including Neuf siècles de guerres saintes (May 1996), UNESCO/ARTE; Sur la piste des caravanes: L’endroit de toutes les rencontres (February 1998); Sur la route des épices (March 2000), UNESCO/NDR/ARTE; and a programme in the Thalassa series on The Slave Route (FR3, April 1998). He is co-author of Patrimoine culturel et créations contemporaines and of Vol. 35, No. 2 of the Journal of International Affairs on the New World Information Order. He has also published many articles on the issue of intercultural and inter-religious dialogue in journals such as Archeologia, Historia, Sciences et Vie, and Actualité des Religions. He was also Editorial Director of From Chains to Bonds, (UNESCO, 1998) and wrote the preface to Tradition orale et archives de la traite négrière (UNESCO, 2001), as well as the editorial of Newsletter No. 2 of The Slave Route (UNESCO, 2001).